Noise pollution is the intrusion of unwanted, uncontrollable, and unpredictable sounds, not necessarily loud, into the lives of individuals of reasonable sensitivities. Using the "reasonable person" standard removes the notion that the judgment of sounds as unwanted is subjective. Unwanted sounds or noises can be traced back to Old Testament stories of very loud music and barking dogs as well as to ancient Rome where city residents complained about noisy delivery wagons on their cobblestone streets. The Industrial Revolution, the growth of cities, and the demand for transportation made the world even noisier. With the modern world so dependent on and enchanted with noise-producing and noise-related technology—automobiles, aircraft, helicopters, motorcycles, snowmobiles, jet skis, leaf blowers, amplified music, bass-driven car stereo systems—the ambient noise level is rapidly accelerating. This growth in noise has led to research examining the impact of noise on the lives and activities of reasonable people. The result has been a body of evidence that strongly suggests noise is hazardous to good mental and physical health. To understand noise, one must know something about sound and how loudness is measured. Sound that travels through the air in waves has two major properties: the frequency or speed at which the waves vibrate and the intensity of each vibration. It is the intensity, or how many molecules are packed together with each vibration, that for the most part produces the sense of loudness, although frequency also contributes to the determination of loudness, with higher-pitched sounds sounding louder. Loudness is measured by a decibel scale (expressed as dB), but to reflect human hearing more accurately a modified version of this scale, known as the A scale, has been developed. On the A scale, loudness is measured in dBAs. The scale increases logarithmically so that an increase of 10 dB indicates a doubling of loudness, and an increase of 20 dB represents a sound that is four times louder. Whispers measure 20 dBA, normal conversation 50 to 60 dBA, shouting 85 dBA, and loud music over 120 dBA. 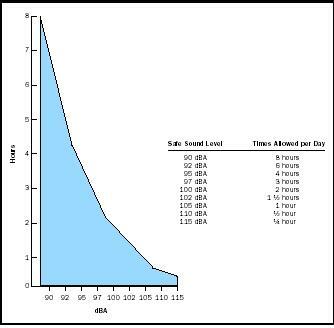 Continuous exposure to sounds over 85 dBA may cause permanent hearing loss. dangerously loud sounds. Teenagers are especially vulnerable as they are more likely to equip their cars with high-powered "boom boxes," attend loud dance clubs, and work in noisy fast-food restaurants. Sounds need not be very loud to be deemed intrusive—for example, the drip of a faucet, an overhead jet, or a neighbor's stereo late at night. Noises are especially bothersome at night when one is trying to sleep, and a good night's sleep is vital to good health. Exposure to bothersome noises over time can be stressful, resulting in adverse health effects, such as hypertension. Although more research is needed to solidify a noise and health link, there is agreement that noise lessens the quality of life. Noises can be especially harmful to children. Scientific research indicates that noisy homes slow down cognitive and language development in young children. In addition, children living and attending schools near noisy highways, railroads, and airports have lower reading scores, and some children living or attending a school near a major airport have experienced elevated blood pressure. successful than others. Traffic noise, especially aircraft noise, is the major source of annoyance calling for better federal regulation within the United States. In contrast, the European Union is finalizing a noise directive that will require member states to produce noise maps and develop action plans to reduce noise levels. Noise from snowmobiles, jet skis, and supersonic jets has also intruded on the environment, affecting animals' abilities to communicate, protect their young, and mate. Worldwide, antinoise groups believe their governments are doing too little to lessen the surrounding din, and groups from the United States, Europe, Canada, Australia, Africa, and Asia have joined together to educate both the public and governments about the long-term dangers of noise pollution, urging them to lower the decibel level. A quieter, healthier environment is within our grasp. Bronzaft, A.L. (1998). "A Voice to End the Government's Silence on Noise." Hearing Rehabilitation Quarterly 23:6–12, 29. Bronzaft, A.L., and Dobrow, S.B. (1988). "Noise and Health: A Warning to Adolescents." Children's Environments Quarterly 5:40–45. Chen, A.C., and Charuk, K. (2001). "Speech Interference Levels at Airport Noise Impacted Schools." Sound & Vibration 35(7):26–31. Evans, G.W., and Lapore, S.J. (1993). "Nonauditory Effects of Noise on Children. A Critical Review." Children's Environments 10:31–51. Federal Interagency Committee on Aviation Noise (FICAN). (2000). FICAN Position on Research into Effects of Aircraft Noise on Classroom Learning. Washington, D.C.
Niskar, A.S.; Kiezak, S.M. ; Holmes, A.; Esteban, E.; Rubin, C.; and Brody, D.J. (2001). 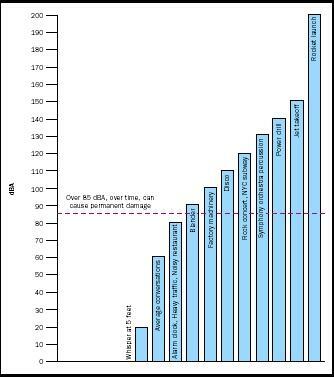 "Estimated Prevalence of Noise Induced Hearing Threshold Shifts among Children 6 to 19 Years of Age. The Third Health and Nutrition Examination Survey. 1988–1994." Pediatrics 108:40–43. Stansfeld, S.; Haines, M.; and Brown, B. (2000). "Noise and Health in the Urban Environment." Reviews of Environmental Health 15:43–82. League for the Hard of Hearing Web site. Available from http://www.lhh.org/noise . Noise Pollution Clearinghouse Web site. Available from http://www.nonoise.org . You need to make your graphs bigger so people are able to see them better because I can barely make out the words on the graph.